Acer held its big annual press event in New York today. Several new products made their debut, but we were most impressed by theAcer Switch Alpha 12, the first fanless 2-in-1 notebook to use a new sixth-generation Intel Core i3/i5/i7 processor. 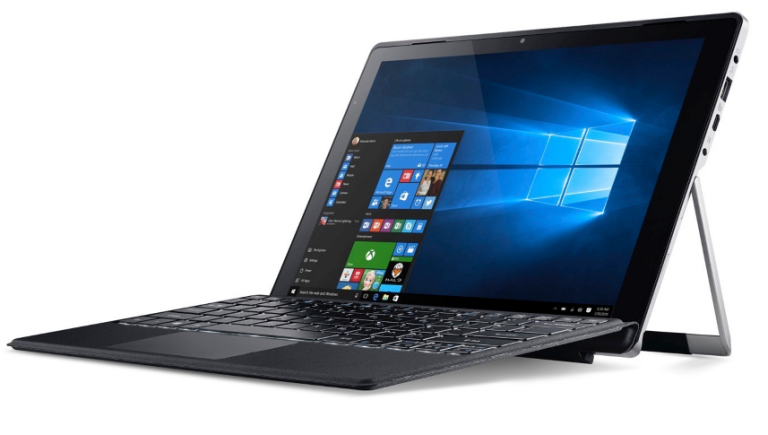 The Switch Alpha 12 is naturally pitched against the Surface Pro 4and Dell XPS 12 with a similar kick stand design to the SP4 (also reminiscent of the HP Spectre x2) and a 2,160 x 1,440 display powered by Intel HD Graphics 520. The fact the aluminum 12 incher is fanless is significant, since some of the best ultaportables - like Dell's XPS 13 and Acer's own Aspire S7 - still make a racket with the noise from their fans. The processor is actually liquid cooled using proprietary Acer LiquidLoop tech. There's also an Acer Active Pen stylus as well as two 6mm-thick keyboards - one backlit, the other not. There's also a 1080p Full HD webcam and a USB-C port for charging and other external connections. Optional USB-C docks are available for the Switch Alpha 12. We also saw the S13 ultraportable with the latest 6th generation high-powered Intel Core processors, a Full HD IPS display (which we badly want) Chromebook 14 for Work, a new spin on the Chromebook 14 withGorilla Glass finish, spill-resistant keyboard and a huge 12 hours of battery life. The Aspire S13 features up to 13 hours of battery life, USB Type-C and USB 3.0 ports as well as Full HD display.